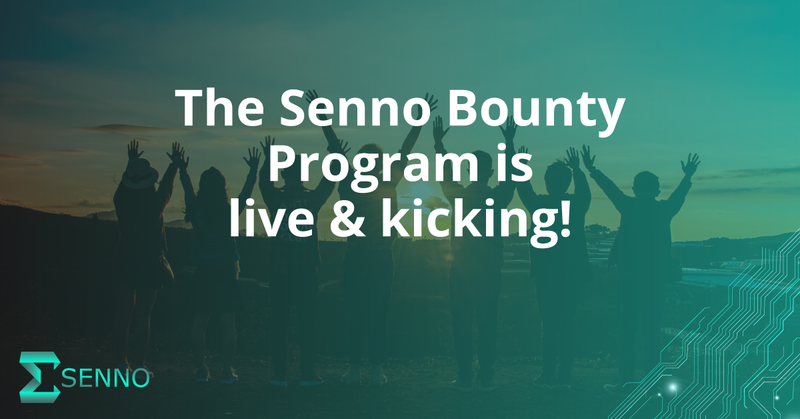 We are proud to announce the launch of the SENNO bounty Program! Bitcoin Forum > Alternate cryptocurrencies > Marketplace (Altcoins) > Bounties (Altcoins) (Moderator: mprep) > We are proud to announce the launch of the SENNO bounty Program! Dear community members, we are excited to announce that Senno has developed and published the login module which is the cornerstone for the Senno protocol. This key module allows users to share selected data with Senno, and get paid with Senno tokens in exchange. HOW DOES THE LOGIN MODULE WORK? This login module will be implemented in Senno clients' platforms (third parties). Users will be able to choose to login with this module, selecting which of their details they would like to share. Next, their data is being encrypted, processed and once used by an advertiser, the user will get Senno tokens as a reward. TRY IT NOW AND JOIN SENNO’S AIRDROP! Senno is distributing 5M Senno tokens to 20 lucky users! Join now to win 250,000 Senno tokens. The first login module – Facebook, is already installed on our website! You can now sign up or log in to your dashboard using this module, and get rewarded with Senno tokens! WHAT SHOULD I DO TO JOIN? Once the airdrop duration is over, we will choose 20 random users to win 250,000 Senno tokens each!  Dates: 10 days, November 26th - December 6th, 08:00AM GMT. We reserve the right to extend the airdrop duration in any case. Distribution: the token will be distributed to the winners until December 11th. Q: When will the distribution start and end? A: Will start during the 25th, it might be a day or two before it will be over. We will announce once it ends. How many tokens I should get? *How to calculate how many tokens I should get? Multiple 1.4018 with the number of entries you collected. launch of the SENNO Bounty Program! NOTE: you MUST join our Telegram group to qualify for bounty payout! Senno is a decentralized NEO based sentiment analysis platform with an open SDK that uses distributed hardware. Senno was created to allow third parties to integrate sentiment and data conclusion tools into their own platforms. real-time indications of the public opinion on a specific entity in any field. To reward our community, we have decided to launch a social bounty program that will last until July 31st. We will distribute 0.5% of our total supply to our community! To join our bounty program, please read the following rules and make sure to check our terms & conditions document. - If you have any question regarding our bounty program, please address them to our bounty Telegram group. - If you choose to follow us on social media channels, you must keep doing so until the end of the ICO to qualify for the payout. - We reserve the right to disqualify bounty payouts to any participant we suspect of cheating or exploiting any of our rules. - We reserve the right to not accept participants for any reason. - You may only register once. We will review the accounts participating in each campaign and disqualify the cheaters. - We have zero tolerance for spam, cheating or abuse. - We reserve the right to stop the campaigns or change the dates at any given time. - You must be over 18 to join the Bounty Program. - Please note that this Program is not intended nor does it allow any participation to U.S nationals and/or U.S residents. In any case, in which you are either a U.S national and/or U.S.
- Bounty distribution will take place 45 days after the ICO has ended. - Bounty payouts will be calculated based on the number of entries you have earned during the bounty period. To better understand the entries system, please read the following article. To join the SENNO bounty program >> CLICK HERE! To be a SENNO translator >> Click here! Q:What's the bounty Bounty allocation? A: 0.5% of the total supply. Q: What are the Bounty dates? Q: How the bounty distribution works? A: Every participant will get SENNO tokens based on the number of entries he gained. A: All the SENNO bounty program participants will get Senno tokens, based on their number of entries. Q: What is an “entry”? how many tokens does 1 entry worth? we use entries instead of tokens to reward you for your efforts. Those entries will eventually be translated into Senno tokens. Please read this article for a better understanding. A: The bounty tokens will be distributed 45 days after the ICO has ended. Q: What is a NEON wallet? A: NEON is a wallet for the NEO blockchain. To receive your tokens, your wallet must support NEP-5. At the moment, please use only NEON. Q: How do I get my tokens? be able to make sure your details are correct. Q: Do I need to complete all the tasks? the more entries you have, the more tokens you will get at the end. Q: How many tasks will you have? When will you add new tasks? A: We will keep adding more and more tasks as time goes by. Whenever we post a new task, we will make sure to update the community. The final number of tasks is unknown. Q: I accidentally typed wrong details- what can I do? A: No worries! Just PM your email and correct answer to @natalie_emissary , we will make sure to fix this for you. Q: What is the “surprise bounty”? A: Besides the regular social bounty tasks, we’ve decided to reward active members of our community in a new special way. (the entries will be added to the Vyper account, participants must join the bounty program to get the reward). Re: We are proud to announce the launch of the SENNO bounty Program! I would like to apply for whitepaper translation in french... and also other stuffs! When will you start the trivia in the telegram group? Hi Jacob, we are happy to see that you are interested in our trivia. The full announcement will be posted on this Sunday (6.5.18), you are more than welcome to join our Telegram group (https://t.me/Sennogroup) and to our Telegram announcements channel (https://t.me/SennoANN) for constant updates! Thank you. Hey. I would like to apply for whitepaper translation for Turkish Language. To be a SENNO translator >> /forms/YVs0lrrGy3rVTUzn2]Click here! Buy & Sell cryptocurrencies in UK.